Paige Krämer Rochefort is working to encourage other marginalized people who might not feel comfortable to give skateboarding a try. When you're a woman, making your way into the skateboarding world isn't always easy. For Paige Krämer Rochefort, it's been even more difficult. She's a transgender woman and a world-class skateboarder based in Saint-Chrysostome, a small town south of Montreal. "Since I'm a female and I identify as female, although it wasn't clear to me [before my transition], I didn't feel like part of a crew, I didn't feel like I belonged," Krämer Rochefort said. Eventually, she gave up. 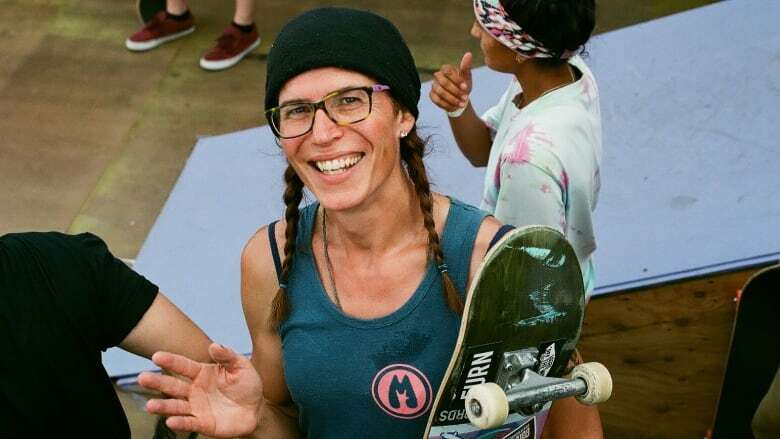 Fifteen years later, and three years after she had transitioned, Krämer Rochefort stumbled on skateboarding again while working out in a park on her 40th birthday. "There was someone in the park I was in who had a skateboard," she said. "I asked if I could borrow it." Right away, she was hooked once again. But skateboarding after her transition still wasn't easy — it was scary. "I was terrified of going to the skate park because I was the only female there, and there was the factor that since I am a trans woman," she said. "I was afraid of verbal violence and physical violence, because it's something that's still very common towards trans people." Now, she's working to encourage other marginalized people who might not feel comfortable to give skateboarding a try. 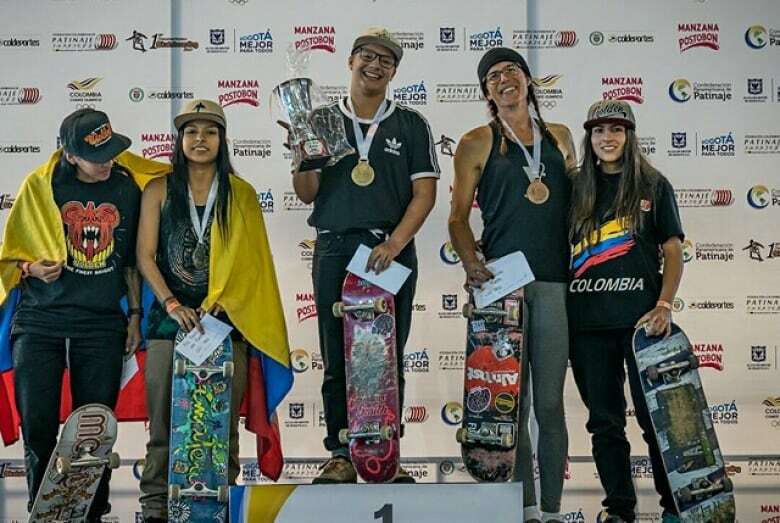 In less than two years, Krämer Rochefort became the first trans woman to win a bronze medal representing Canada in skateboarding at the Pan-American Skateboarding Championship in Bogota, Colombia. 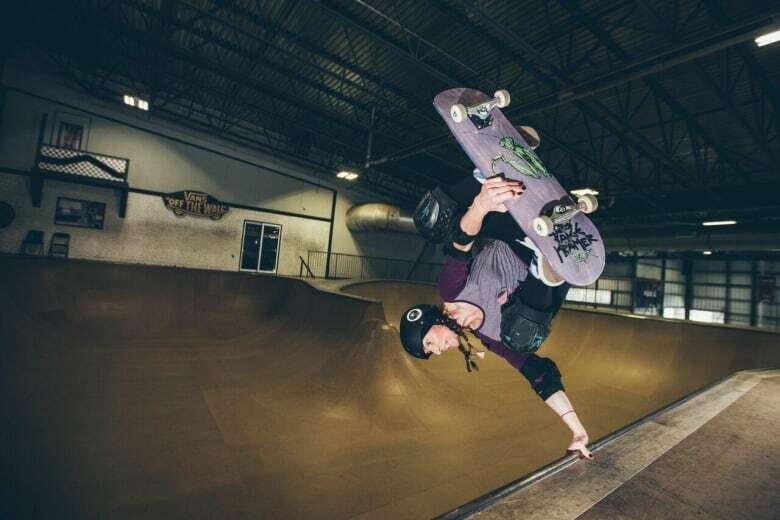 She's also the first trans woman to step up onto a podium at a World Cup Skateboarding competition, winning third place at Jackalope Action Sports Festival in Montreal in 2016. She said she will likely be competing at Jackalope again in August. There aren't many transgender skateboarders — Calleigh Little is recognized as the first transgender woman to skateboard across the United States, while Hillary Thompson is also on the sport's radar — though it's difficult to know who is and isn't transgender. For safety reasons, some transgender people don't disclose the fact that they're trans. Though it's a mostly independent sport where personal development is key, having a group of people who support and encourage you is extremely important, especially if you're marginalized, Krämer Rochefort said. That's why she started a group called Marginal Skateboarders, along with fellow skateboarder Bil Gagné. It's similar to Montreal women and girls' skateboarding group Les Vagabonnes, who offered Krämer Rochefort a safe space when she started skateboarding after her transition — but the focus is on the more marginalized LGBTQ community. "We needed something that was more focused on queer, trans, non-binary worlds — the people on the margins of society," said Gagné. The group communicates information about the queer skateboarding community via its Facebook page, and organizes meetups. "Already, as a woman, skateboarding isn't easy," Gagné said. "When you're a non-binary or queer woman, it becomes harder to feel comfortable." Krämer Rochefort makes Marginal Skateboarders clothing and stickers out of her home. "The goal is for [Marginal Skateboards] to become a symbol for everyone who feels a bit marginalized in skateboarding," she said. She wants people to see the logo and realize that there are open-minded people at skate parks, and already feel less alone and less afraid — like she once felt. "One of my main goals is being public about being trans, and that I've been through a transition. As long as it helps."